On this page we show our twitter account and the posting that are there. Please feel free to join the conversation and add you comments. The principals of Janco typically do between 4 to 10 tweets per week. Most of the tweets contain links to pages of interest to CIOs, CSOs, IT Managers, and key IT Professionals. We do not post anything that is of a political nature or reflect negatively on individuals or organizations. The tweets are related to the management of the IT function and should be of interest to CIO, IT managers, and IT Professionals. These posts are controlled by Janco Associates, Inc.'s CIO and prior to submission are reviewed by our executive management team. There never are any posts which are not directly related to the mission of the firm. The firm's mission is to be a source of tools which IT Professionals and Human Resource Professionals can utilize. We never post any negative comments about individuals or organization. It is not forum for political statements or violations of individual or corporate privacy. If you ever see any such post for these tweets, please notify us immediately as we will take immediate steps to correct the situations. All of the approved items posted are in compliance with our corporate policy. All of our employees have read and signed statements on file which say they understand this policy. In our firm violation of these policies are grounds for immediate termination. 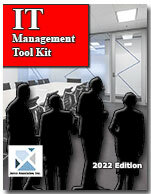 CIO Management Tool Kit is a must have item for every enterprise.